Tell the users that there is a problem and how to solve the problem. Also tell the users where the problem occurred. Users have are trying to fill in Form and one or more of the fields is syntactically invalid or missing. Usually, there two kinds of problems: a) the field has not been filled in at all, or b) the field contains data in the wrong format. That an error has occurred. This is best done by displaying a colored box at the top of the page containing a "important notice". The notice must say what the problem is and that the users can repair the problem by going to the "problem"-field and changing the input. Where the error occurred. This is also done by stating the problem fields in the box at the top of the page in combination with a marking at the problem field itself. For example, the form widget can be colored as is done in the example above. How the error can be repaired. This is done by giving repair information next to the problem field. This information must be marked visually in order to stand out as being "help information". 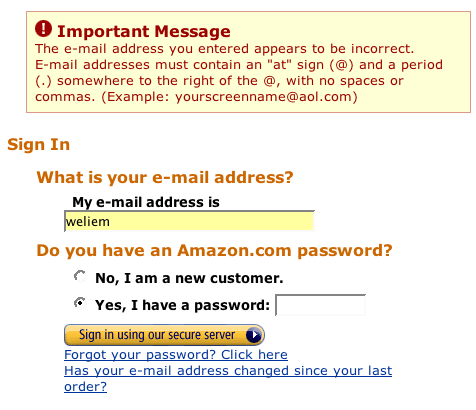 Usually, such help information tells to users about the correct syntax of the entry field. Although giving good error messages is important, one should always assess if the problem can be prevented! For example, using Constraint Input is can sometimes be possible to prevent incorrect input. Obviously, users must be made aware of the fact that there is a problem. Doing this a the top of the page in a visual distinct box assures that users will see it. In addition, users must receive helpful information that will put them on track again. TO achieve that it is important to give help information near the problem field itself so that the "problem" and the "solution" are close to each-other. This example from www.vanguard.com shows a variation where a popup window is used to display the error message. The goal of the pattern is to improve the user experience by minimizing input errors. The objectives of the pattern is to (a) inform user that an error occurred during input, (b) notify user where the input error occurred, and (c) minimize the likelihood of a repeated input error. User experience plummets when users are notified multiple times that there were an input error. (2) Provide users with an example of the correct information again at the applicable data entry field (Example - placing "Example: name@email.com" above or below the Email Address text entry box). To add to this I would like to say that error messages have a large emotional impact on users. Any form of error messaging can cause stress. Therefore any way to minimise the impact of the error message should be found. The short answer is "it doesn't". However, it is possible to go the long way - the page can be submitted, checked by a program, and redisplayed to the user with the errors highlighted. It takes longer to do this, but the result is the same. Regarding user stress and the colour red. Having developed several systems and having interacted with various levels of users, I can assure that "red" does not always mean "danger". Red = Danger is one of several interpretations. Perhaps if you were in a car, yes, red would be intepreted as Danger. On a web page? Where is the danger? Red is primarily used to significantly highlight sections of the page. See the example above where it draws your eye directly to the place of error. Blaringly obvious? Yes. But, that's the point. In a recent project, we found that the CA software did not highlight errors. No red. No nothing. Just throws a message up saying that there is an error. It is horrible. There's lots of references there.